Allentown is noted for its history and outdoor spaces, its recent revitalization has made it a good option for active adults. If you’re thinking about retiring in Pennsylvania, don’t write off Allentown. Founded back in 1762 by William Allen, this town of over 120,000 inhabitants has undergone revitalization, and is now a vibrant city for active adults and their families. Allentown played a major part in the American Industrial Revolution, contributing iron to the country’s new railroad network. At the start of the 20th century, production of silk, cigars, and furniture (among other things) became more prevalent. Things have since changed, especially after the State passed the Neighborhood Improvement Zone legislation in the last decade. Allentown received over 1 billion dollars for development, which recreated the downtown infrastructure, attracting new businesses and home seekers. Allentown’s renewal extends to its award-winning parks system, the city has more acres of parks than any U.S. city that is the same size. Its other landmarks include Dorney Park, the PPL Center, the Shops at City Center, and the famous Allentown Fairgrounds Farmers Market. There is plenty to do and see in this part of the Lehigh Valley, and there are many diverse Allentown, PA real estate options. Here is a bit of information about our favorite Allentown area 55+ communities that lean towards the lower end of the price scale. Our most budget-friendly option is Red Hill Estates, located just outside of Green Lane Reservoir and Park, 20 miles south of Allentown. This established 55+ neighborhood has 260 single-family homes built between 1987 and 2003. These charming homes come in two ranch models, either 1,120 or 1,493 square feet, with two or three bedrooms, two bathrooms, and one-car garages or carports. A monthly homeowners’ association (HOA) fee provides for exterior maintenance and sidewalk repairs. The property has a private clubhouse, parks and natural space, and trails. The closest golf course is local favorite Macoby Run, while the Upper Perkiomen Valley Library, grocery stores, shops, and other services are just minutes away. Drive 17 miles west of Allentown and you’ll run into Easton, a town of about 27,000 that is home to The Village at Upstream Farm. This affordable, gated active adult community has 124 resale attached homes. The attached ranch-style models come in three floor plans, from 991 to 1,180 square feet, with one bedroom, one or one-and-a-half bathrooms, and attached one-car garages. Two of these models feature dens, which can be used as a second bedroom. The community clubhouse has an exercise room and activity rooms, which are used for social groups and other gatherings. Easton is a thriving small town with several parks and its own waterfront along the Delaware and Lehigh Rivers. It has plenty of restaurants, shops and galleries; it even has its own arts trail, the Karl Stirner Arts Trail, which has pieces and displays by national and local artists. The famous Crayola Factory is also here, a great spot to take the grandkids. Arbour at Morgan Creek, an intimate active adult community, is in desirable Bucks County, a half hour drive from Allentown. When completed, there will be 85 attached new and resale carriage-style residences built by Ryan Homes. There are two models sized at 1,528 or 2,250 square feet with two to three bedrooms, two-and-a-half bathrooms, and attached two-car garages. Every home includes an unfinished basement and a first-floor master suite. Options include gas fireplaces, sunrooms, and luxury owner’s suites. The community has a private clubhouse with a large activity room, and the property has a scenic walking trail, a pond, and a gazebo. Arbours at Morgan Creek is in a peaceful, quiet setting near several churches, yet it is less than five miles from Quakertown’s city center, where you can find daily conveniences. Also in Quakertown, Arbours at Hearthstone will have 133 new and resale attached homes after it is developed. The three floor plans range from 1,565 to 2,100 square feet, with two to three bedrooms, one-and-a-half to two-and-a-half baths, first floor master suites, great rooms, and attached garages. Upgrades include bay windows, porches, tray ceilings, and second-floor laundry rooms. Arbours also has a clubhouse with a fitness room as well as walking and biking trails on the property. A monthly HOA fee covers snow and trash removal, landscaping, and common area maintenance. Arbours at Hearthstone is just around the bend from Arbours at Morgan Creek, and shares the same advantages of this bucolic Quakertown location. 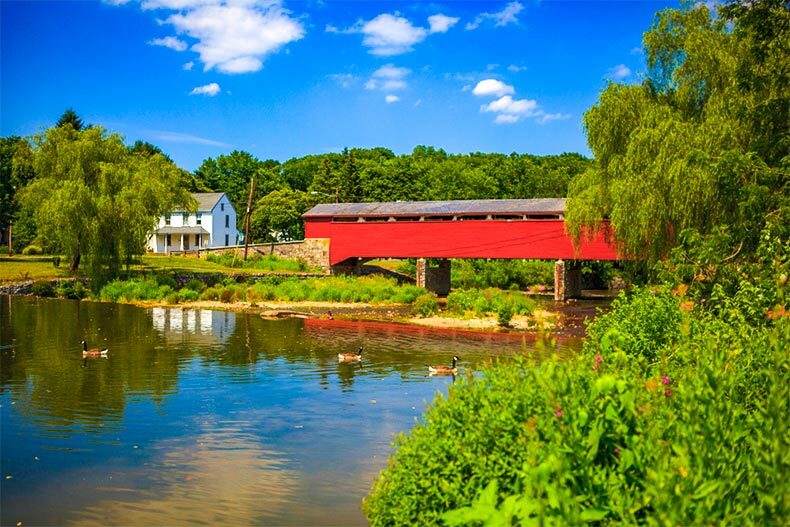 Both of these 55+ communities are also only about 40 minutes from Philadelphia and Bucks County attractions, like the historic covered bridges, the Andalusia Historic House & Gardens, the Delaware Canal, and too many others. The Vineyards in Pennsburg is a gated neighborhood with 200 attached, resale homes about 19 miles south of Allentown. It has four models sized from 1,761 to 2,130 square feet, with one to two bedrooms, one-and-a-half to two bathrooms, a den or library, and attached garages. Some models feature sunrooms and porches. In addition to the Vineyards Clubhouse, the community property gets bonus points for having its own chip-n-putt golf course and putting green, two playgrounds for the grandchildren, walking & biking trails, and picturesque parks and trails. The Vineyards is also close to Macoby Run and Sweet Water Golf Course.